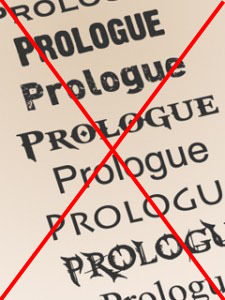 Prologues are a long-running tradition in some genres of fiction, especially epic fantasy. Those of us who grew up reading Robert Jordan and George RR Martin have almost come to expect them at the start of the tome-sized fantasy novel. Robert Jordan’s prologue in The Eye of the World (Book #1 in his WoT series) offers a classic example (Warning: spoiler ahead). The brief but powerful scene shows a man wandering through the scene of a massacre — one he created, but is unable to recognize — until he’s confronted by his enemy, who heals him enough to glimpse the reality of what he’s done. Chapter 1 takes place hundreds of years later with the book’s actual protagonist. And the prologue, it turns out, had all kinds of foreshadowing for what’s to come. That insane man from the massacre is long dead, but… well, let’s just say, we’ll meet him again later. When I began querying literary agents, I did a huge amount of research. In this information age, it’s remarkably easy to collect data about what agents and editors are looking for, so much that I find it surprising when poorly informed would-be authors query agents with a genre they don’t represent. But I digress. Notice how similar those are to the reasons fantasy authors like prologues? This very topic was discussed on my favorite writing-related podcast, Writing Excuses. Brandon Sanderson pointed out that prologues have been done so often in fantasy books that they’re almost a cliché. He warned against using them. And remember, Mr. Sanderson’s not a literary agent or an editor. He’s the author tapped to finish Robert Jordan’s Wheel of Time. The publishing industry has changed Jordan and Martin and other scions were cutting their teeth. A new author trying to break in now faces more competition than ever before. One consequence is that the first chapter of a novel is super important. It’s often make-or-break for a book. The literary agent will read it, as will the editor, and eventually the customer before deciding to hit the Buy Now button. It should probably not be about something that happened years before the story begins. I have heard literary agents say that 90% of prologues are unnecessary. This means that the vast majority of aspiring fantasy and sci-fi authors who have a prologue at the beginning of their book need to cut it. I can tell you from first-hand experience that they won’t like hearing this, even as a small part of them recognizes the truth to it. Go up to the top of the page, delete “Prologue”, and write “Chapter One.” If you break yourself out of the prologue-required thinking, and if you can make it work, the prologue can just be the start of the book. Cut the prologue, and work any necessary details into the story. Honestly, this is probably the way most of us should go. It’s what I decided to do, and it was not as hard as I feared. The time I spent writing the prologue — or other parts of the book that had to be cut, for that matter — was not wasted. It served me in getting to know the characters better, and in plain old practice at the writing craft. It truly gave me the impetus to write the rest of the book. Sure, I had to cut my prologue from the polished manuscript, but (in my mind), it will always be an important part of my novel. What’s Your Opinion on Prologues? Leave me a comment and weigh in! Ready to Put Science in Your Fiction? Science and technology have starring roles in a wide range of genres--science fiction, fantasy, thriller, mystery, and more. Unfortunately, many depictions of technical subjects in literature, film, and television are pure fiction. A basic understanding of biology, physics, engineering, and medicine will help you create more realistic stories that satisfy discerning readers. This book brings together scientists, physicians, engineers, and other experts to help you write realistic and compelling scientific elements to captivate readers. Well, the WOT prologue is pretty much tops in my book, so I might be a little biased. 🙂 But I tend to agree with everything you said. As a reader, I love a good prologue! But what we sometimes forget as writers working on that shiny first draft is the slew of not-so-good prologues agents see behind the scenes, the ones that never get to us as readers. It’s so tricky to do well. I think today’s pacing also leans away from the this-will-be-monumentally-important-in-book-13-but-till-then-you’ll-have-to-trust-us vibe of many prologues. Fortunately or not, you are correct, sir. Most prologues can be replaced with the strongest 1st chapter possible – which *also* manages to foreshadow the best elements of the book-whole. How do you do this? That’s what’s called writing. Unfortunately I do not have the reader buy-in that GRRM does. Alas. And yes, I could work X and Y into the world, and I *do*. But since they are things the protagonist has no way of countenancing until much layer, it just seems like I’m expositing too much about seemingly unrelated details. A sci-fi adventure series by Dan Koboldt, Mindy McGinnis and Sylia Spruck Wrigley. In the wake of two major hurricanes, the Bermuda Triangle comes alive again. A basic understanding of biology, physics, engineering, and other subjects can help authors create more realistic stories. If you're into writing, publishing, or reading fantasy & science fiction, I'm glad you're here. We should connect. By E-mail. This is the best way. You'll get updates whenever I have news to share or post new articles. No spam, I promise! On Twitter. I love following and retweeting authors & fans of SF/F. On Goodreads. I love books. You love books. We should connect there. Click on the big red X on the top right to close this box. Copyright © 2019 by Dan Koboldt. All rights reserved.